"Just a Nurse," by photographer Earl Dotter and journalist Gordon, at the Hospital of the University of Pennsylvania in Philadelphia through May 18. Nurse Janice Skot, the president and CEO of Ontario's Royal Victoria Hospital, published a good May 8 op-ed today in The Barrie Examiner, "Today's nurses are at the forefront of Canadian health care." Skot provides a lot of information about modern nursing, but one of the most needed bits of information she conveys is simply that she is a nurse--that nurses have the knowledge and skills to become hospital chief executives. Skot's main theme is that most people don't understand how complex nursing really is, and she notes that the theme of this year's Nursing Week in Canada is "Think You Know Nursing? Take a Closer Look." (We applaud this theme, though we have to note that none of the four images on the main promotional graphic (above) actually shows any nurses.) She explains that nurses today are front-line clinicians, educators, researchers, and administrators like her. Their varied tasks include direct care, advocating for patient safety, helping patients adapt to health issues over the longer term, and promoting healthy practices in society at large. Skot notes that an RN today "requires a baccalaureate degree in nursing." Skot's piece is generally strong, though we saw a couple minor issues. Her suggestion that nurses are "very special" because they have an "X factor" that reflects their "dedication and passion" for patient care strikes us as less helpful than her longer explanations of everything nurses actually know and do. Skot also emphasizes how far nursing has come from the early days of "learning your nursing skills by following the lead of the Lady Superintendent" of a hospital, and we're always a little uneasy about pieces that take such pains to distinguish today's nurses from their predecessors. It seems to us that many professions have evolved considerably over the last hundred years, but you're unlikely to see physicians, for instance, working so hard to distance themselves from their predecessors. Of course, their predecessors got real respect, and it may be easier to show the public that it's wrong about nurses today than to persuade it that it's been wrong for over a hundred years. Nancy Banfield Johnson published a strong nurses week op-ed May 8 in The Ithaca Journal --something that is getting to be an annual tradition for her --entitled "Honor the Nation's Nurses This Week." Last year, Johnson celebrated the week by persuasively debunking some of the most damaging "myths" about nursing. 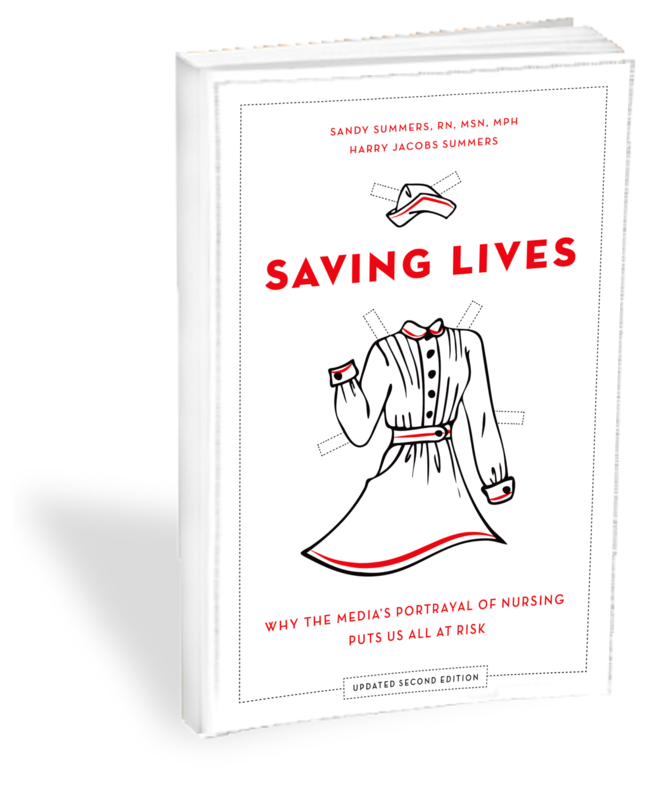 This year, she devotes her piece to an account of her own three decades in nursing, which, given what Johnson notes are the "few positive role models of nurses in the media," may likewise dispel some myths. help me publicize the positive aspects of a nursing career. Nursing is an autonomous profession requiring scientific knowledge and clinical skill. We need registered nurses saving lives and making significant contributions to the health of our nation. I am proud to be a registered nurse making a difference in peoples' lives from birth until death. I love nursing! Maybe someone you know would too. Nurse Kathleen Bartholomew's powerful op-ed "Nurses struggle against the odds" ran May 7 in the Seattle Post-Intelligencer. Bartholomew's piece is a more comprehensive argument about the nursing crisis, and the key role it plays in problems that plague the overall U.S. health care system, which is both underinclusive and overpriced. She says hospitals are "financially flailing," and nurses feel the impact, facing sicker patients and increasingly complex care; many nurses are burning out and fleeing the bedside. Bartholomew argues that most of what nurses do is "invisible" to "the patient, doctor, and society." She focuses on nurses' critical thinking and assessment skills, explaining that nurses save lives by constantly checking medications, looking for early signs of complications, reviewing lab results and data. She argues that current pressures have reduced the time nurses can spend with patients, reducing the "compassion" and emotional support nurses can provide, and causing nurses themselves to feel unfulfilled and burned out: "An R.N. who is running around day after day with no time for lunch begins to feel like a robot because of the overwhelming volume of tasks." Bartholomew directly challenges her society's priorities, arguing that it's "not OK for a professional ball player to make $63 million a year while nurses work without meals or breaks, and patients barely see their nurses," or for there to be so many uninsured and so many preventable errors. And she urges readers to pressure the government for change, noting that until they do, nurses will struggle to "solve the problems resulting from a health care system that operates as a business, instead of a universal right." We have seen the escalation of crime and violence coming into the work circuit not only by staff members, but against staff members, nurses in particular, from patients and relatives themselves because they are not served fast enough or because the attention given to them was considered less in quality compared to another patient, just to name a few. ... We cannot have a patient attacking the very person who was placed there to care for them. There must be serious consequences for these actions against a nurse and it is up to us to speak up and let our voices be heard against such acts. Mullings reportedly argued that nurses cannot be expected to continue caring for those who have attacked them (non-nurses might be surprised to hear that that occurs). He noted, with some understatement, that that places the nurse in a "vulnerable position" and can "create psychological trauma." Mullings suggested that in addition to the patient's bill of rights, perhaps there should be a "Nurses or Employee Bill of Rights" which would make clear that such violence will not be tolerated. Mullings specifically commended the relatively few men in nursing in the Bahamas, noting that recruiting more of them is especially important in addressing the global shortage. The piece closes by noting: "Activities planned for Nurses Recognition Month include a morning devotion, nurses' breakfast, float parades and a nurses' symposium." "TV Nurses Don't Represent Reality"
In the middle of the worst nursing shortage in our nation's history -- which, according to the Bureau of Labor Statistics and others, [means] we'll be short by about 800,000 nurses by 2020 if things don't change quickly -- Hollywood tells us that hospitals are a doctor-only affair and that patients can recover without any nursing care whatsoever. We shouldn't let Hollywood lull us into thinking that nurses do next to nothing. "The Faces of Caring: Nurses at Work"
Earl and Suzanne have given a voice to the too-often silent story of [the] nurse's vital role in patient care. Nurses are microbiologists, chemists and scientists. They are strong patient advocates. We need to make sure more people know about, seek out and benefit from their expertise. We commend all responsible for the above items, and wish you a nurses week without end.